The Eastern Shore of Virginia Foodways Project invited a small group of nationally known food writers, chefs, and sustainable agriculture experts to Northampton County for a two-day immersion course in our extraordinary culinary history and culture. Hosted in early June, 2010, our on-the-road and at-the-table seminar introduced our guests to seasonal delicacies as well as year-round products. We enjoyed conversations with individuals knowledgeable in all aspects of Eastern Shore food production, preparation, history, and culture. The June fieldtrip consisted of two full days of tours through which visitors and residents interacted and learned from each other. 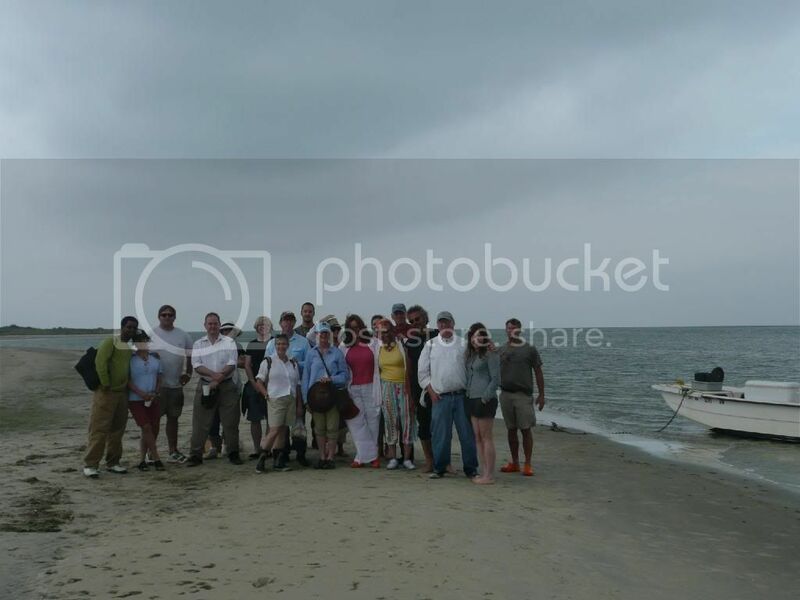 The two day tours introduced our guests to the cultivation of Hayman sweet potatoes, clam and oyster cultivation, soft crab shedding, drift net and pound fishing, heritage grain milling, and much more. An orientation at the Barrier Islands Center and walking tour of Eastville provided key historical background. The culmination of those conversations unfolded on the final evening of our explorations with a collaborative dinner centered on Eastern Shore products, pairing nationally-renowned chefs and writers with local cooks. The ingredients for our dinner were acquired through the course of our visits over the previous two days. See below for details about the guests. Marcie Cohen Ferris is an Associate Professor of American Studies at the University of North Carolina at Chapel Hill where she is also the Coordinator for Southern Studies. Her courses include “Shalom Y’all”: The Jewish Experience in the American South, Cooking Up a Storm: Exploring Food in American Culture, Mamas and Matriarchs: A Social History of Jewish Women in America, No Place Like Home: Material Culture of the American South, and Introduction to the American South: A Cultural Journey. She is the author of the James Beard Award-nominated book, Matzoh Ball Gumbo (UNC Press, 2005) and co-editor of Jewish Roots in Southern Soil: A New History (Brandeis, 2006). Her current work, “The Edible South: Food and History in an American Region,” is a social history of southern foodways, which explores the cultural, social and economic practices that relate to food in the American South. Molly O’Neill was a reporter for The New York Times and the food columnist for its Sunday magazine from 1989 to 1999. Her first book, The New York Cookbook (1992), won both the Julia Child/IACP and James Beard Awards. She is also author of A Well Seasoned Appetite (1997), and The Pleasure of Your Company (1997). She hosted the PBS series “Great Food.” Molly O’Neill has received three James Beard citations, as well as the society’s Lifetime Achievement Award. She has twice been nominated for a Pulitzer Prize and is the editor of the Library of America’s anthology, American Food Writing: An Anthology with Classic Recipes. Molly O’Neill was also a restaurateur and among the first to actively source local things for the American table. Her upcoming book, One Big Table, a portrait of America at the table, will be published in late 2010 by Simon & Schuster. The book is the ultimate community cookbook, a portrait of Americans and their food. Molly O’Neill spent a decade traveling around the Country to gather and test recipes. Working with America’s Second Harvest, this project is both a delaration of American foodways and an initiative aimed at ending hunger in America. The book will include a number of recipes from the Eastern Shore of Virginia. David S. Shields is McClintock Professor of Southern Letters at the University of South Carolina-Columbia. He is the director of the Southern Texts Society and Chairman of the Carolina Gold Rice Foundation. [http://www.carolinagoldricefoundation.org/] He holds a position on the Editorial Board for Common-Place, The Interactive Journal of Early American Life. He publishes scholarship in several fields: performing arts photography, the history of the book, early American culture, and the influence of changing agricultural practices on the history of American cuisine. He is the author of many books including Pioneering American Wine (2009). He is currently building a website that will be launched by the Center for Digital Humanities at the University of South Carolina in June 2011 on traditional American vegetables—their agriculture and cookery. John T. Edge is director of the Southern Foodways Alliance at the University if Mississippi. John T, a James Beard Award winner, writes for the New York Times, the Oxford American, and Garden & Gun. His essays on American foodways have been featured in seven editions of the Best Food Writing. He has written six books and has served as editor for a number of other texts including the foodways volume of the New Encyclopedia of Southern Culture and the book series, Cornbread Nation: The Best of Southern Food Writing. Bill Smith is the chef of the restaurant Crook’s Corner in Chapel Hill, North Carolina where he incorporates both traditional and modern Southern foods and practices to craft a new Southern cuisine. Gourmet magazine has named Crook’s Corner as one of “America’s Best Farm-to-Table Restaurants.” Bill Smith is the author of the cookbook Seasoned in the South: Recipes from Crook’s Corner and from Home (2005). The James Beard Foundation honored Bill Smith as a finalist for Best Chef Southeast at the 2009 and 2010 awards. Crook’s Corner was also nominated by the foundation for Outstanding Restaurants in the United States. Chef/owner Andrea Reusing collaborates with nearby family farms in her marriage of North Carolina ingredients and Asian flavors at her Chapel Hill, North Carolina, restaurant, Lantern. Since opening in 2002 it has been named one of “America’s Top 50 Restaurants” and “best farm-to-table restaurants” by Gourmet, as one of “America’s 50 Most Amazing Wine Experiences” by Food & Wine and as “Restaurant of the Year” in 2009 by The News & Observer. Reusing, named one of “15 Green Chefs” on Grist’s international list, partners with local farms on a dinner series, The Lantern Table and serves on the boards of the Center of Environmental Farming Systems and Chefs Collaborative. A 2010 James Beard Nominee, Reusing’s book Cooking in the Moment: A Year of Seasonal Recipes will be published by Clarkson Potter in April, 2011. A New Orleans based writer and filmmaker, Lolis Eric Elie currently writes for the HBO series Treme. Working with the director, Dawn Logsdon, he wrote and co-produced the documentary, Faubourg Treme: the Untold Story of Black New Orleans. For fourteen years, Lolis Eric Elie wrote a thrice-weekly column for the New Orleans Times-Picayune. He is the author of Smokestack Lightning: Adventures in the Heart of Barbeque Country, and the producer of the documentary, Smokestack Lightning: A Day in the Life of Barbecue. A contributing writer to The Oxford American, Lolis Eric Elie’s articles have appeared in a number of national and local publications including Bon Appétit, The New York Times Magazine, and The Times-Picayune. Ann Cashion is the co-chef-owner of Johnny’s Half Shell and operates Taqueria Nacionale in Washington, DC. Ann Cashion has worked in restaurant kitchens domestically and abroad for over twenty years. She owned and operated Cashion’s Eat Place in Washington D.C. for over ten years. She is a member of The James Beard Foundation, Women Chefs & Restaurateurs, and The Southern Foodways Alliance, and is a national board member for the Council of Independent Restaurants of America. Ann Cashion has been a featured speaker at the National Museum for Women in the Arts and was included in the cookbook Women of Taste. Her culinary work taps into regional foodways and ingredients, reinventing them for new audiences. Jessica Harris is one of the preeminent voices in histories of African, Caribbean, and African-American foodways. Her eleven cookbooks include Beyond Gumbo: Creole Fusion Food from the Atlantic Rim (2003), Iron Pots and Wooden Spoons: Africa’s Gifts to New World Cooking (1999) and Sky Juice and Flying Fish: Traditional Caribbean Cooking (1991). Her narrative history of African Americans and food will be published in 2011. She has also contributed to numerous other books as well as articles for Food & Wine, New York Times, and The New Yorker among others. She is the founder and director of the Dillard University Institute for the Study of Culinary Cultures Harris has been honored numerous times including an appreciation award from Walt Disney World Epcot Center, the Heritage Award from the Black Culinarians, and the Food Hero award from Eating Well Magazine. In May of 2010, she was inducted into the James Beard Who’s Who of Food and Beverage in America. Ari Weinzweig is CEO and co-founding partner of Zingerman’s Community of Businesses, which includes Zingerman’s Delicatessen, Bakehouse, Creamery, Catering, Mail Order, ZingTrain, Coffee Company, Roadhouse and the newest business—Zingerman’s Candy Manufactory. Zingerman’s produces and markets full flavored, traditional foods in its home of Ann Arbor, Michigan. He is the author of a number of articles and books, most recently, Zingerman’s Guide to Better Bacon (Zingerman’s Press) and Zingerman’s Guide to Good Eating (Houghton Mifflin). His next book, Zingerman’s Guide to Good Leading, Part One: A Lapsed Anarchist’s Approach to Building a Great Business will be released Fall 2010. In 2006 James Beard Foundation recognized Ari Weinzweig in the “Who’s Who of Food & Beverage in America”. Lorraine Eaton is the staff epicure at The Virginian-Pilot newspaper, located in the Tidewater region of Virginia. A journalist for 25 years, she has won state and national awards for investigative and feature writing, and now happily roams around Tidewater and the Outer Banks of North Carolina bringing the flavors of the region to her readers. She has written extensively on the foodways of the Eastern Shore of Virginia with specific articles on Pungo Farm Mills, Eastern Shore sweet potato varieties, the Chesapeake ray, Shooting Point Oysters, and Sewansecott Oysters. As the former senior articles editor at Gourmet, Jane Lear expanded the magazine’s literary and reportorial coverage. In 1999, she developed the innovative concept of an annual produce issue that connected field and fork. She developed and wrote regular features about culinary techniques as well as the long-running “Kitchen Notebook” section, and reported travel stories on destinations ranging from the American South to southern India. A contributor to The Gourmet Cookbook: More than 1,000 Recipes, Gourmet Today: More than 1,000 All New Recipes for the Contemporary Kitchen, and Martha Stewart’s American Food, she is also the co-author, with New York City chef Floyd Cardoz, of One Spice, Two Spice: American Food, Indian Flavors.